Don’t worry; there’s nothing wrong with your monitor or your screen resolution – you really are seeing eight sash cramps and four 12in G-cramps!!! Assembly was fairly smooth, considering all that had to go together at the same time. 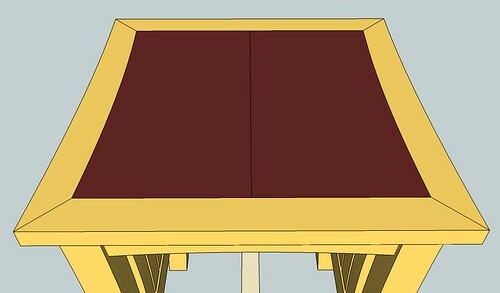 That’s essentially everything apart from the back rail and slats, which were only fitted dry – the seat, four curved legs, one stretcher rail assembly and two arms. 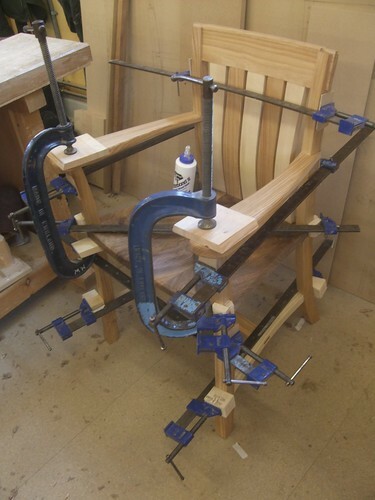 If I’d really to strain myself then, yes, I could probably have glued the back components in at the same time…! 😕 Thanks to some double-sided tape (used to hold all the cramping blocks in position), I was just about able to manage this one on my own and I don’t think it took any longer than ten-minutes – by which time (rather disappointingly), I could see that Titebond’s “Extend” wood glue was already starting to go off… Then again, they say that standard PVA has an open time of five-minutes in the college workshops so, I guess it’s still some improvement… Cascamite (urea formaldehyde) would’ve given me an advantage here but, at the same time, I’ve always been led to believe it’s quite ‘brittle‘ once dry and shouldn’t be used in chair assemblies as it can quite easily ‘crack‘ and fail under stress. 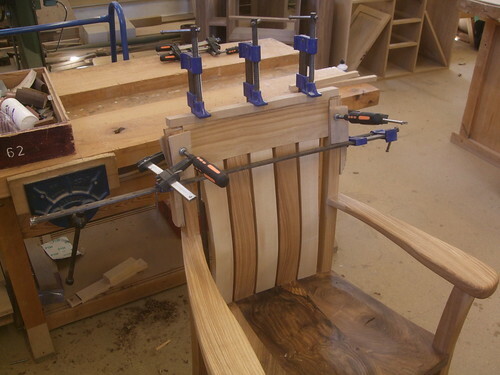 Wow that is alot of clamps, I don’t think I own enough clamps to pull that one off. Lovely chair Olly……..and I like the look of the table you’ve started. I knew you would eventually come around to my way of thinking re. belt sanders!!! Really good to hear from you. Nice to know you’re still lurking. Thanks, glad you like both the chair and the table. What can I say about belt sanders… I honestly don’t know how I managed without one for so long!! Now, I don’t have to waste ten-minutes sanding with 60g orbital discs to remove machining marks – a belt sander fitted with a 120g belt will do that in seconds! Also, the finish is “better” where random orbitals tend to ‘ease over’ the edge of a table top and can create dips in a flat surface, if you’re not careful (I’ll still use my ROS for fine sanding, though). Hope all is well, Mike. I’m really liking the contrasting back slats of the chair – I’ve always avoided thinking about making chairs, but I now have a pressing need for an office chair, and may well blatantly steal your contrasting slat design feature. 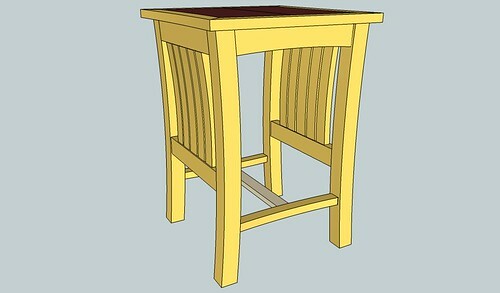 The design for the small table is looking good. The only thing that catches my eye is the position of the low rail/stretcher arrangement, it seems a little low and takes a little of the effect away from the curves of the leg, but i’m certainly no expert on these matters. 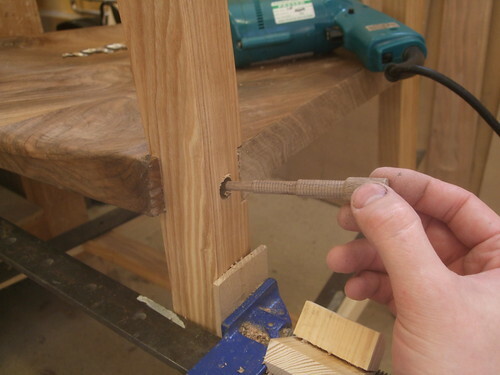 Thanks, yes, I’ve had a lot of good feedback on the slats even though, I did have my doubts when I was doing it… It was almost intuitive; I looked at the timber I had available and was hoping they would all come from the darker heartwood. 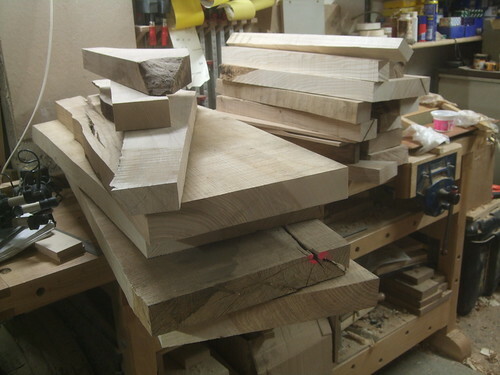 But, that would’ve meant cutting in to some of the larger boards I was hoping to save for future projects… With the contrasting stretcher rails and also the difference between the ash frame and walnut seat, it’s become a continuation of a theme. I agree with your thoughts on the table. It was looking okay until I shortened it by 100mm… 🙄 To me, the stretchers are necessary as there’s nothing else down low to brace the leg frame. It’s currently about 120mm high and I intend to raise it to about 150mm (which is where it was before and also, where it is on the chair).